A gritty high tech world where the art of electronic intelligence and covert surveillance reigns supreme. Where guerilla strategies and savage combat are the norm. Build bases, muster forces and dominate your enemies. All for the love of power. 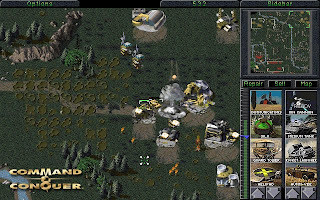 Whether playing as the Brotherhood and obeying the charismatic Kane's every command or taking control of GDI forces as they seek to save the world from Kane's ambition, every detail of Command and Conquer is just as you remember it. The original full motion videos tell the story in what was once cutting-edge and is now quaint, and the gameplay is simple as can be. Gather Tiberium to produce tanks, infantry and more to decide the fate of the world.